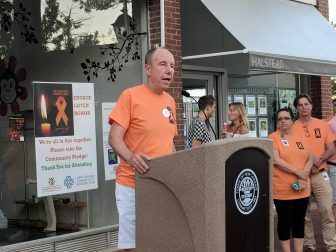 Nearly 500 people gathered at the corner of South Avenue and Elm Street on Thursday evening to attend New Canaan’s second annual Overdose Awareness Vigil, hosted by the New Canaan Parent Support Group and the New Canaan Community Foundation. 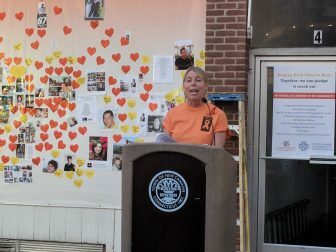 Residents of New Canaan and neighboring towns, state and local officials, professionals in recovery treatment, clergy and those in recovery and with loved ones who have encountered the pain, heartache, hardships and struggles addiction brings formed the crowd. The founder of the New Canaan Parent Support Group, Paul Reinhardt, whose son Evan’s passing in July 2015 from a drug overdose inspired him to create the group, said shared stories will keep the conversation about addiction and recovery going and, hopefully, encourage others to open up and share their struggles as well. Shaw’s work, however, became excruciatingly personal in August 2015 when one of her five children, her son Gregory, died of an opioid overdose at the age of 25, she said. After becoming more tolerant of the painkillers, Gregory started using heroin because it was both “cheaper and easier” to obtain, she said. Gregory would complete detoxes and rehab stays at some of the finest acute care facilities on the East coast. Shaw and her family tried everything they could think of to help her son, she said. However, Gregory’s life ended tragically too soon before he could find his pathway to sustainable recovery. 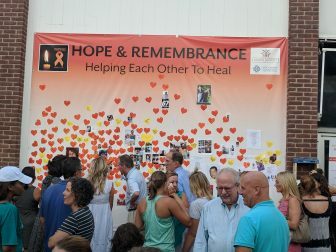 The event again featured a “Hope & Remembrance” banner that gave attendees the opportunity to share both photos of, and messages to those who were in their hearts. And several tables of pamphlets and posters with information about addiction and paths to recovery were also made available for attendees to learn more about the dreadful disease. The event’s emcee was once again John Hamilton, chief clinical outreach officer and licensed alcohol and drug abuse counselor for Mountainside Treatment Center in Wilton, who has more than 30 years of experience in the field of addiction and mental health issues. 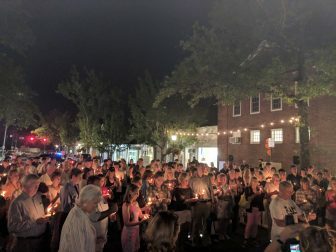 And for the second straight year, the evening concluded with a candlelight vigil, led by clergy and local faith leaders as those in attendance prayed in unison for those they have lost and those in recovery.